Have you ever looked for a beauty brand who's products not only look good from the outside but are also good (vegan, cruelty free, natural & organic) inside? Look no further. Have you ever wasted your time in the stores looking at products and thinking "Will I like it? ", "Is it worth the hype? ", "Should I really spend my money for the full size product?". Because let's be real the testers that they give out in the stores - you can't really test a day/night cream for 2/3 days and know that it is 100% for you. Madara knows our struggle so they have come a step forward and have created a starter set with their 3 best selling products and smaller sizes of their famous tinting fluids. 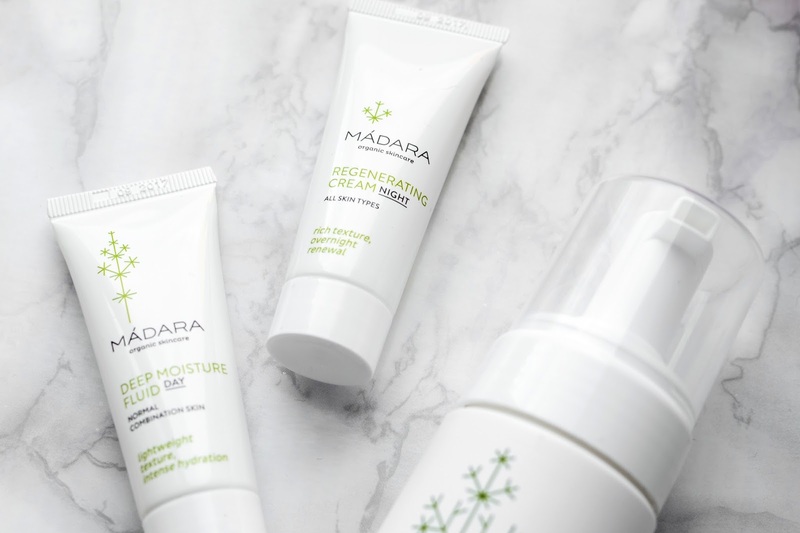 I received these products at the start of the year, but the only product I started using right away was the purifying foam, because with the winter in it's glory, I like to use products that are very moisturizing, kind of heavy duty, but I did take the deep moisture fluid and regenerating cream to L.A. and they were perfect for that weather! After that I have been using them all on and off, but recently almost every day. 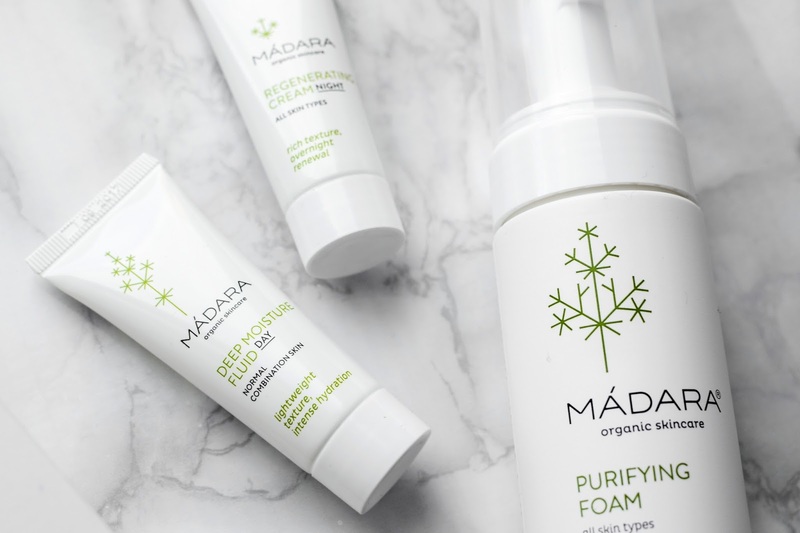 In the Become Organic starter set you get 3 products - purifying foam (150ml/5 fl. oz. ), a deep moisture fluid (25ml/0.84 fl.oz.) and a regenerating night cream (25ml/0.84 fl.oz.). 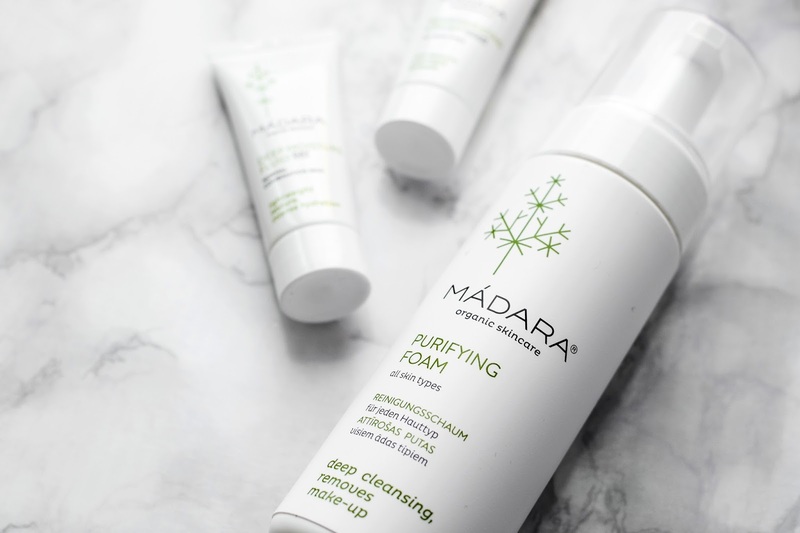 • In Purifying Foam you will find such active ingredients as northern yarrow extract, rose, calendula and chamomile. It has rich and soft foams that deeply and gently purifies the skin and removes make-up (suitable for use around the eyes). It really does regulate oily zones, but I'm not really sure about the promise to soothe dry areas, because after using it my face usually feels very clean, what I love about the product, but also quite tight and dry, so you should apply your day/night cream right away. My friend (with a sensitive and dry skin) complained that it made her face feel uncomfortably dry. Otherwise I really enjoy using it and will definitely repurchase it when I will finish this one. • The Deep Moisture Fluid's active ingredients are rose, red clover, raspberry, avocado, linden flower and mugworth. It is meant to deliver an intense 24-hour hydration while normalizing combination skin by balancing out oily and dry areas. It has a lightweight texture that easily absorbs into the skin. I think it is the perfect moisturizer right now when it is not too cold outside - there is no need for a very rich moisturizer and the sun barely shows up (no SPF). It works with every primer and foundation that I have tried. I will continue to use it until the sun will become a more frequent guest. • Besides rose and avocado, the Regenerating Night Cream also contains algae, sea buckthorn, tomatoe, plantain, calendula and chamomile. These active ingredients promotes the skin’s ability to repair itself and helps to neutralize daily environmental damage. It has a rich texture that easily absorbs into the skin. I love how my skin feels soft and tight after using it. I think this would be the perfect moisturizer for spring/summer time. Besides this starter set, Madara also came out with 15ml/0.51 fl.oz tinting fluids. I got the Moonflower that has a rose beige tone. The Northern Rose Hip extract and natural pigments instantly hydrates and perfects the skin’s appearance - tints, illuminates and evens out the skin tone. It's basically a BB, CC, DD etc. cream cousin. From all of the products this one I have tried the least. It does look really nice on the skin, my sister even said that after applying it my face looked like I had just come from a sunny vacation, but I just can't get over the smell of it. 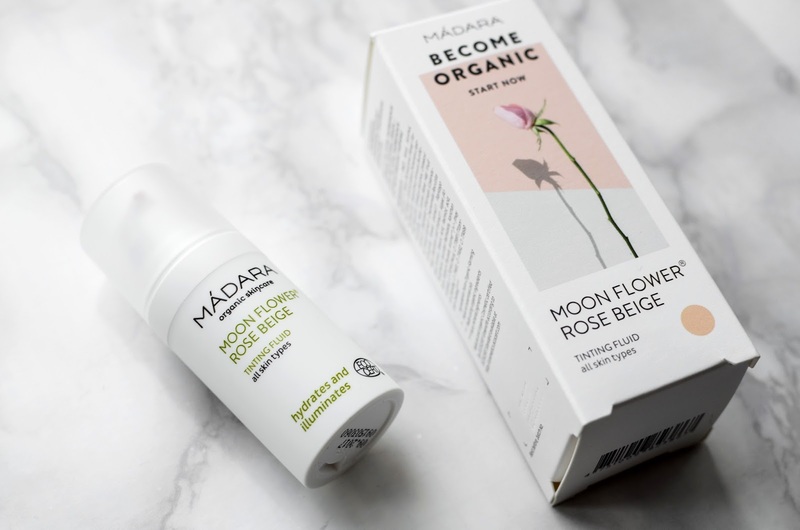 If the Deep Moisture Fluid and Regenerating Night Cream have a very settle scent that is actually quite lovely and that quickly disappears, then Moonflowers scent is very strong and to me smells like grass and doesn't disappear that quickly. 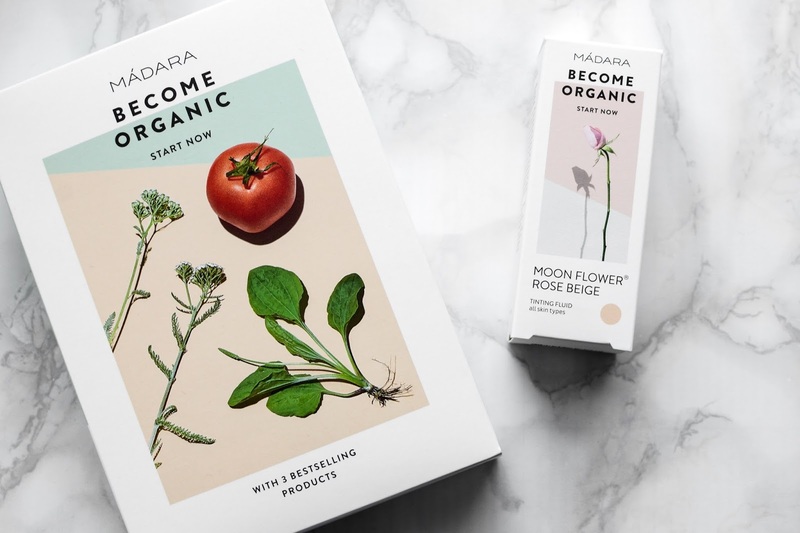 And I'm not really sure which of the active ingredients makes it smell like that, because it contains basically the same ingredients (rose, calendula, chamomile, plantain and algae) as the two moisturizers, the only two ingredients that are only in Moonflower are sunflower oil and rosehip. 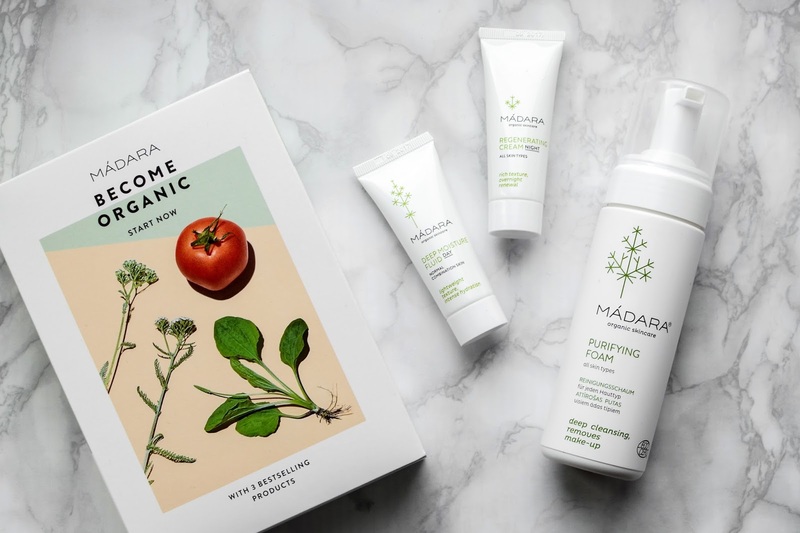 3 comments on "MADARA | BECOME ORGANIC"